until I found them in my own garden. In my weekly Weight Watchers meetings a common question that I ask my members is, “What changes have you made to your food choices since you started the WW program?” Most members cite eating breakfast each morning, many state drinking more water, and a common change is planning out a weekly menu. I know one of the first changes that I made to my shopping cart was that I stopped purchasing juice. After figuring out how many Points Plus was in a glass of juice, I realized that juice was not worth my PP budget. Not to mention that many store-bought juices contain sugar and other ingredients that do not promote health. 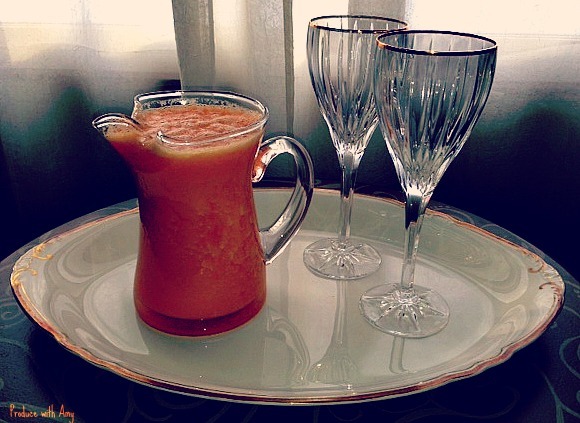 However, sometimes I really want a glass of juice with my brunch on the weekends. Buying a Vitamix blender was one of the smartest kitchen investments that Mike and I have made. I make a variety of foods in our blender: my morning green smoothie, hummus, cold green soups, pureed soups, sauces, frozen summer cocktails, and I even use it to make fresh juice. 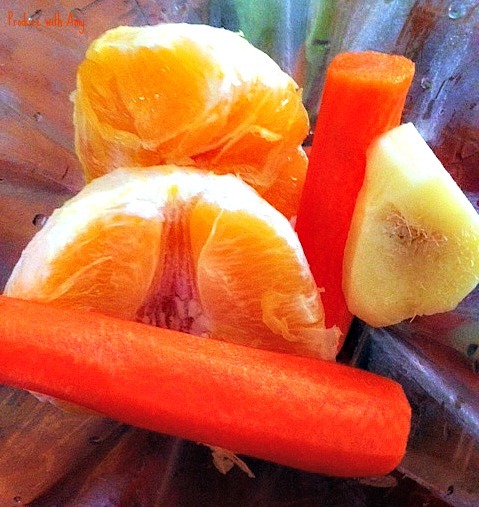 While I really have considered investing in a high quality juicer, I love that when I make juice in my blender that I retain all the fiber in the fruit and vegetables. Blended juices are more filling and because the fiber is retained it takes our body a bit longer to absorb the nutrients. 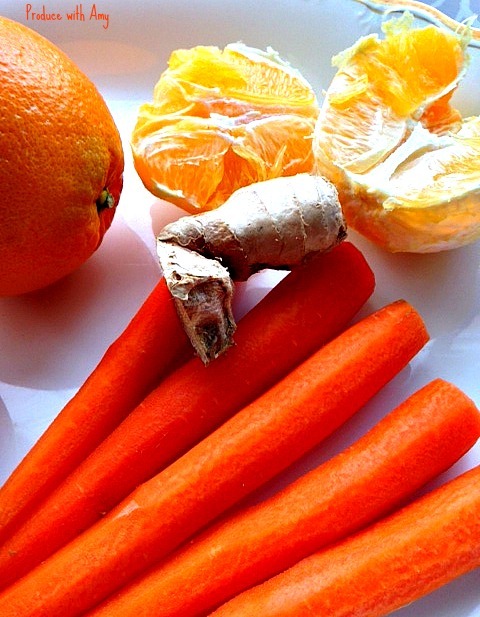 This slower absorption helps avoid blood sugar spikes that come with juices made in a juicer. This morning I really was craving juice so I blended up one of my favorites. 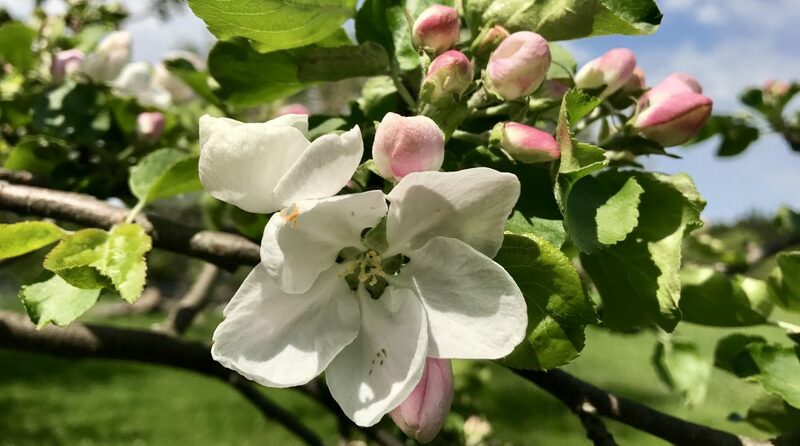 It is inspired from a gorgeous city that Mike and I consider our favorite vacation destination ~ Asheville, North Carolina. Asheville has an incredible eclectic vibe and features restaurants with the most exquisite local Vegan and vegetarian fare. One of our personal favorites is The Green Sage Coffeehouse & Cafe. If you go there I highly recommend their Veggie Hummus Wrap and their fresh pressed Carrot Ginger Juice. Since oranges are still readily available at the grocers, I decided to add some citrus to our juice. All it takes is three simple ingredients to make fresh Carrot, Orange, & Ginger Juice in your blender (four if you count the water). 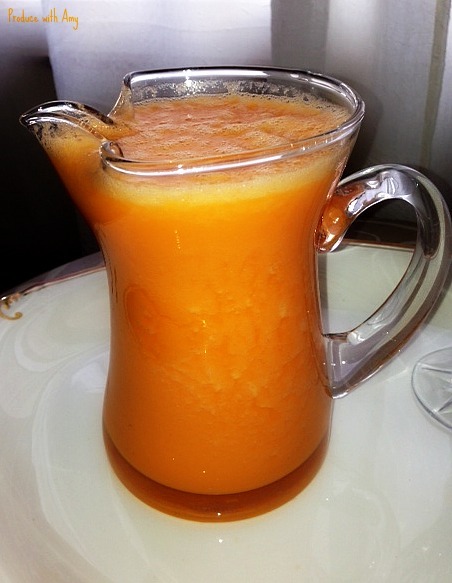 This recipe makes approximately four cups of juice (depending on the size of the oranges and carrots that you use. Blend on low for 30 seconds and on high for 60 seconds. Since the blending will warm the juice a bit, I make mine in advance and let it sit for a while in the refrigerator. If you want to drink the juice immediately you could add ice in place of the water. A high-powered blender like a Vitamix is ideal for this juice. It also makes the high price tag in purchasing one worthwhile. 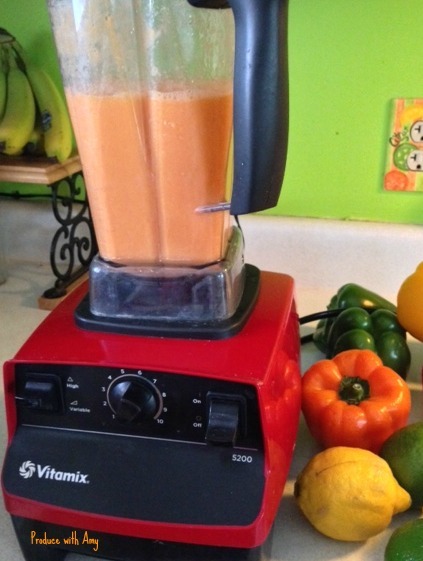 When we bought our Vitamix I was determined to use it every day and I have been successful in this goal. 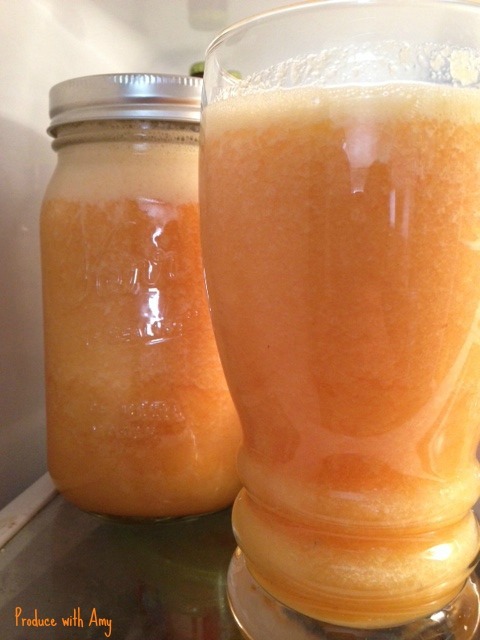 The resulting juice will be quite frothy (it will settle in the refrigerator) and since blending retains the juice it will be thicker than conventional juices. You may add extra water to juice to thin it out. This juice would also be great with the addition of grapefruit and I really like the combination of carrots, apple, and ginger. Mike and I each drank one cup with our breakfast and I stored the remaining juice in a Mason jar in the refrigerator to drink this week. 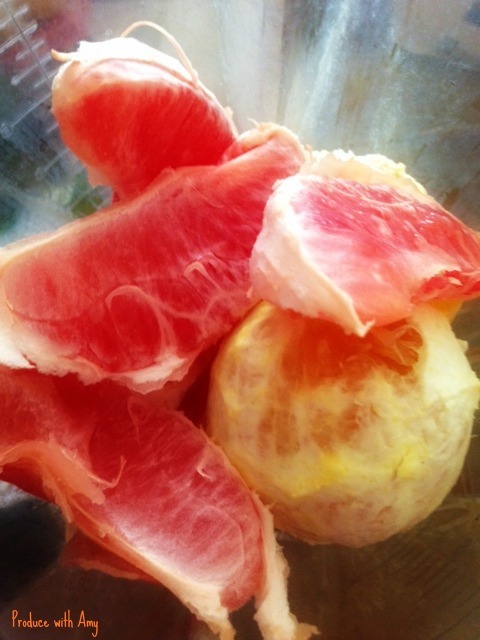 This weekend Mike started to feel a cold coming on so after breakfast I decided to whip him up some fresh citrus juice. I added four oranges, half a grapefruit, and a cup and a half of water. The juice tastes fresh and does not need the addition of sugar. He will add a little fresh water to his glass before drinking and the burst of Vitamin C will help boost his immune system. Who needs store-bought juice when you have a Vitamix? If you experiment with your own juice please let me know what you think. Do you have any favorite combinations? If you are interested in checking out my other blender recipes check out my Green Smoothie recipes. Stay tuned, my upcoming recipes include Mason Jar Salad recipes to add to my growing list and my recipe for a plant-based Creamy Lemon Dill Soup. I am having a productive weekend and I hope you are too. 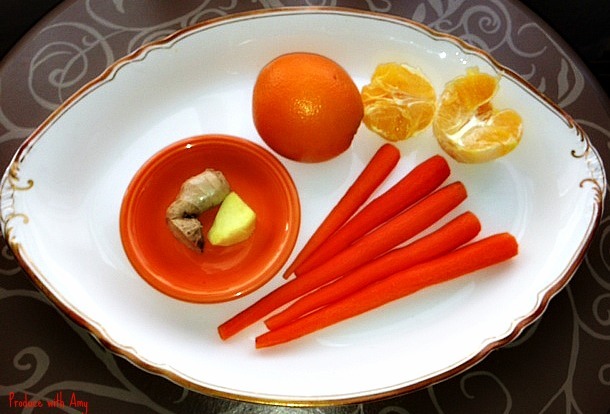 Thank you for joining me on this journey to maximize our health by eating an abundance of fruit and vegetables. 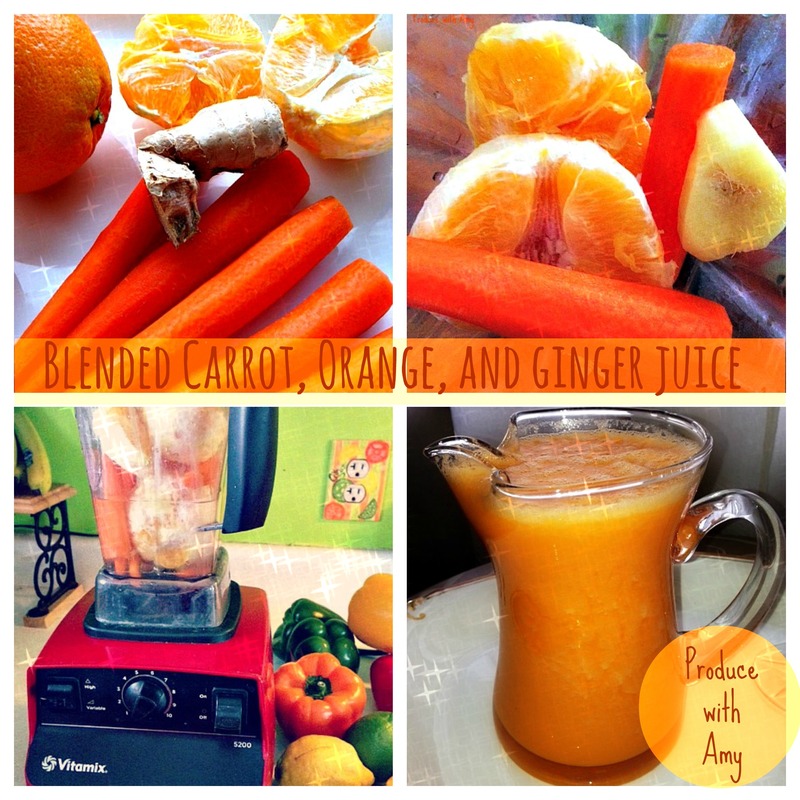 This entry was posted in Juice and tagged Blended Juice, Carrot Juice, Carrot Orange & Ginger Juice, Ginger, Homemade Orange Juice, Vitamix, Weight Watchers by Amy. Bookmark the permalink.